Written by Magnus Jepson on December 23, 2010 Product news. Our WooTumblog plugin has been downloaded over 2700 times already, and our Express app for iPhone has already been purchased by over 500 people, which proves that “tumblogging” is a very popular niche nowadays. We contacted James McDonald and asked if he wanted to design a Tumblr theme for us a while back, and he produced the stunning and detailed Auld for us. 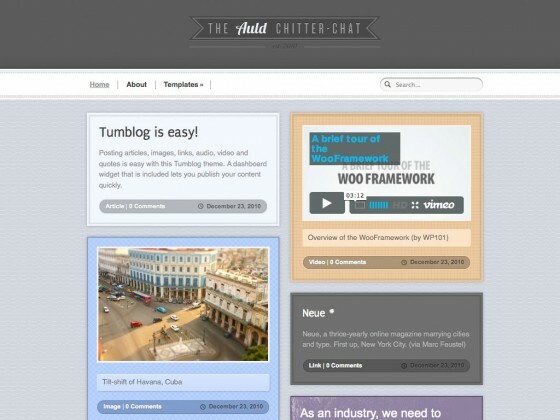 With the popularity of WooTumblog, we decided to release it on WordPress instead of Tumblr. The theme was a perfect fit to use with the jQuery Masonry plugin, which allows the post blocks to align perfectly on the homepage in a two column fashion. Check out his Dribbble page for some more great visual design by this up and coming designer. Take a look at the theme features and preview the theme demo. Most of the WooCrew will now take a long sought after Christmas break, and we’ll be back in the new year with more awesome goodies for you! From all of us at WooThemes, have a merry Christmas and a happy Woo Year! thanks for the great work you’ve been doing, and a merry christmas to all of the wooCrew. WooTumblog plugin is a true sweet goodie from you. very clean design but maybe I am just too old lol.. I don’t really see many potential uses for this… will definitely be on the lookout in the showcase to see what people come up with for it. Any chance the WooTumblog gets a bookmarklet a la ‘Press This’ ?